It’s November, which means that we’ll be getting our hands on a few more NES classics as part of the Nintendo Switch Online service. The online channel, which launched back in September, already has a handful of classics that players can enjoy whether they’re going at it on their own or playing against friends online or locally. These include the likes of Donkey Kong, Super Mario Bros. 3, Ice Hockey and a handful of others. This month -- likely next week -- we’ll be getting three more titles to join the fray adding to the value of the service, since it goes for just $20 a year (or $4 a month) and gives you online access to favorites like Splatoon 2 and Rocket League, among others. Here’s a rundown of the games you’ll be seeing join Nintendo Switch Online this month. First up is that classic Konami shooter, which, if we recall, hasn’t been seen on the NES in the U.S. In it, you’ll shoot a variety of enemies with your adorable looking ship, while picking up some helpful power-ups along the way. If you’re a fan of “shmups,” add this one to your list. Next up is this classic from the old-school Tecmo era, in which you guide a hero around a stage to defuse bombs while also dealing with enemies. Like Solomon’s Key, Mighty Bomb Jack is an acquired taste, but certainly worth giving a try if you’re a fan of the NES-era games. Finally, Metroid is likely to be the “big one” of the group as you can live out the classic adventure of Samus Aran through the comfort of your Switch. Play through hours’ worth of an open world, taking out enemies and picking up new items (like missiles and other goodies) to help you do battle with the Mother Brain! 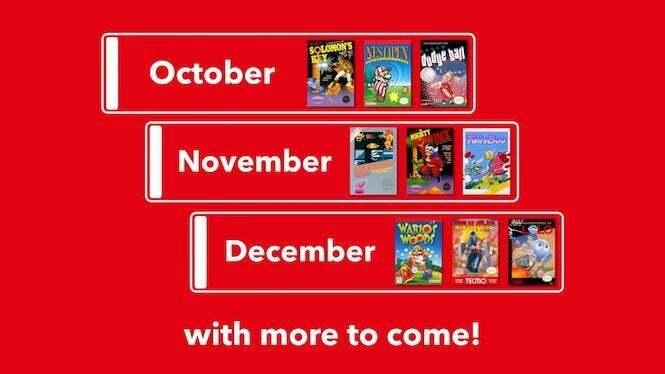 Even more games are coming our way in December, including Wario's Woods and the classic Ninja Gaiden; and we’re pretty sure a fresh slate of titles are set to be announced for 2019, including several first and third-party hits, including ones from Capcom and Konami. For the time being, however, the service is well worth checking out, especially if you’ve been looking to settle a grudge in Balloon Fight or just want to beat Super Mario Bros. 3 all over again. And really, who wouldn’t want that?! The Nintendo Switch Online service is available now.